British holidaymakers airlifted from a cruise ship stranded in rough seas off the Norwegian coast have described their "frightening experience". 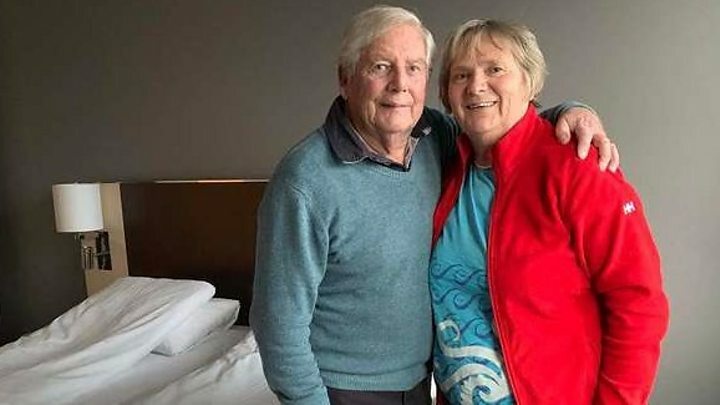 Derek and Esther Browne, from Hampshire, were among 200 Britons on board the MV Viking Sky when it sent a mayday call on Saturday. Helicopters and ships were called in to rescue the passengers and crew. Another passenger, George Davis, from Manchester, said it took 10 hours for him and his wife Barbara to be rescued. 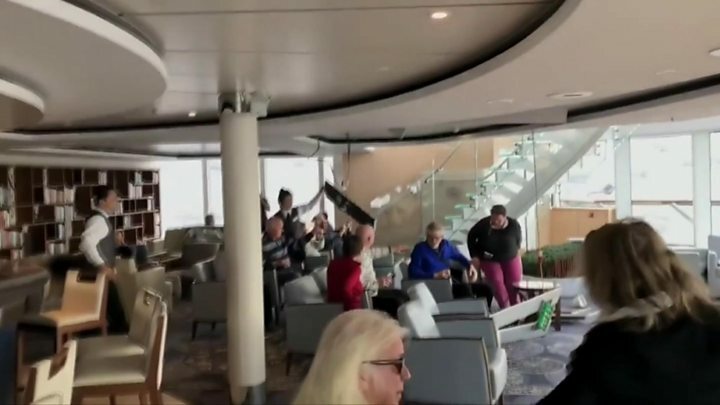 Viking Cruises said in a statement that of the 1,373 people originally on board, 894 guests and crew remain on board, while the 479 who were airlifted are on shore with arrangements being made to fly them home. Twenty people suffered injuries and some remain in medical care, according to Viking Cruises. Three people were thought to be in a serious condition, local media group NRK reported. Mr Browne told BBC Radio 5Live's Stephen Nolan show: "We had a few people on stretchers, several with cuts, a few with broken limbs." He said the ship had been "rolling and rolling" all night on Friday before losing engine power on Saturday. The ship's crew managed to anchor the ship in Hustadvika Bay, according to police in Moere og Romsdal, amid fears the vessel would run aground. Mr Browne said: "We were going for the afternoon film show and the lights suddenly went out and then suddenly more rolling. We heard the anchor being dropped and then we were told: 'Mayday, mayday!' And the bleeps went off on the radio and that was it - we all had to evacuate." The evacuation was hampered by the conditions, he said: "The lifeboats couldn't function and the rescuers couldn't come out because the seas were so rough, so they sent helicopters. "Two helicopters had to take off 930 passengers". He said it was "quite a frightening experience". "I'd never been in a helicopter before," he said. "There were a lot of high winds, hovering overhead and the winchman came down and we were then collected up and so I shut my eyes as we arrived into the helicopter, and there were 15 of us for about a 20-minute ride." By 22:40, 155 people had been brought to shore. George Davis, from Manchester, told the BBC he and his wife Barbara waited 10 hours to be rescued from the ship. "It was a very scary event", he said, adding: "Locals tell us they were amazed that we sailed into the teeth of a storm they knew was coming". Speaking from a hotel in in Kristiansand, Mr Davis said: "It was one of most frightening moments I've had, because the waves - we just sort of lost it really and couldn't quite work out where the ship was going. "It was swinging everywhere. The wind was terrible - it was freezing cold as well". Chris and Debbie O'Connor, from Kingston-Upon-Thames in London, were among those who stayed on the ship overnight. Speaking to the BBC from the ship, Mr O'Connor said the conditions outside were "outrageous" on Saturday, leading him to feel safer staying on the vessel. He said: "The thought of going out in those 40 mph winds and those 30 foot waves up to a helicopter - I did not want to." The boat is being towed to the city of Molde, on Norway's west coast, authorities said. Website MarineTraffic shows the vessel was en route to Stavanger from Tromso, and is drifting off the town of Farstad near Molde on the country's western coast. The area is known as the Hustadvika and is reportedly one of the most dangerous stretches of Norway's coast.